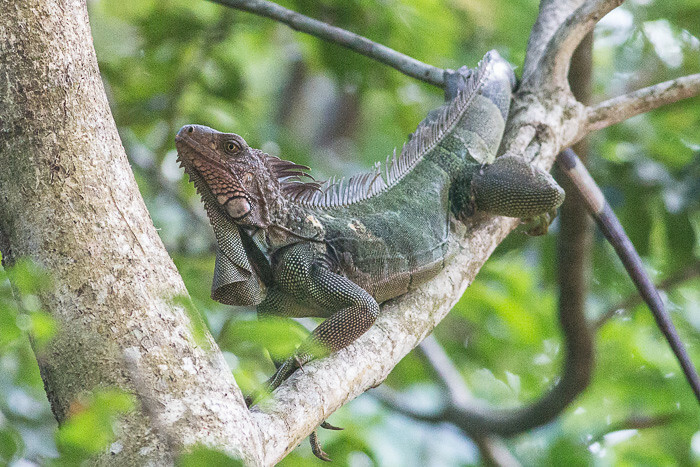 This afternoon I headed towards the top of the Cerro Ancon. I walked around the hill along a busy highway, then scooted into the park. It was deserted. Funny that, because it was very nice bush. 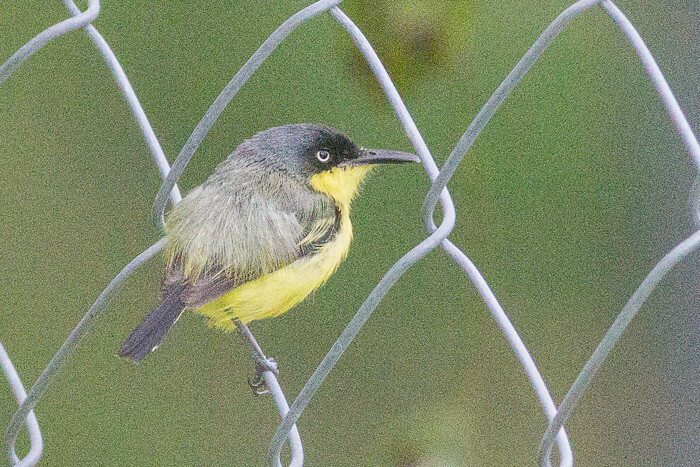 This Common Tody-flycatcher was hanging around the fence at the edge of Cerro Ancon. I was pretty stoked to get a photo. I think this is right. 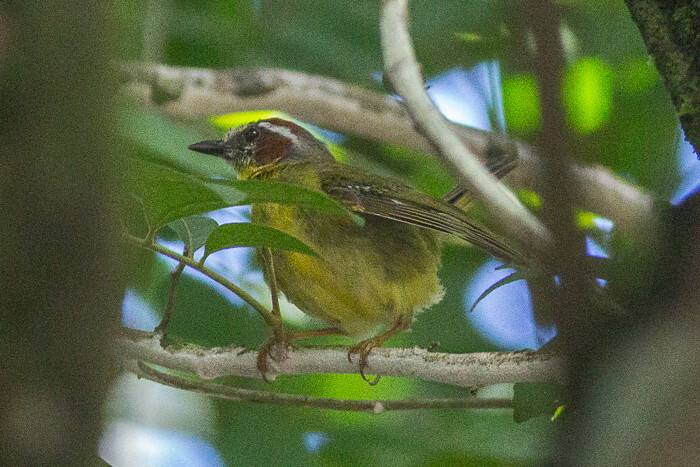 Also known as Yellow-olive Flatbill. 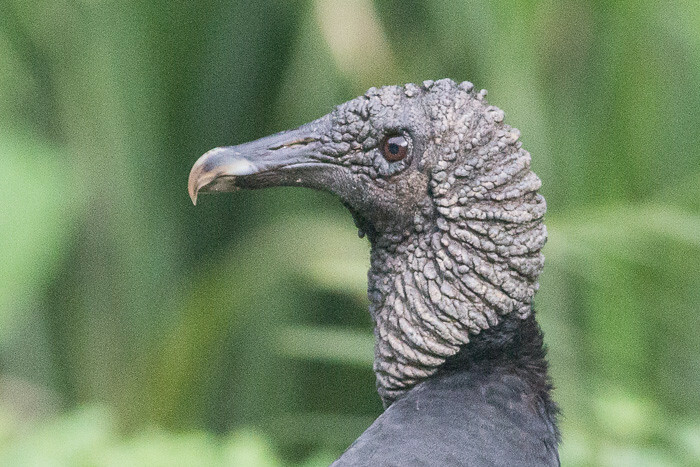 I saw quite a few vultures circling overhead. It is quite eerie. I made it to Panama City and got into my hostel before dark. 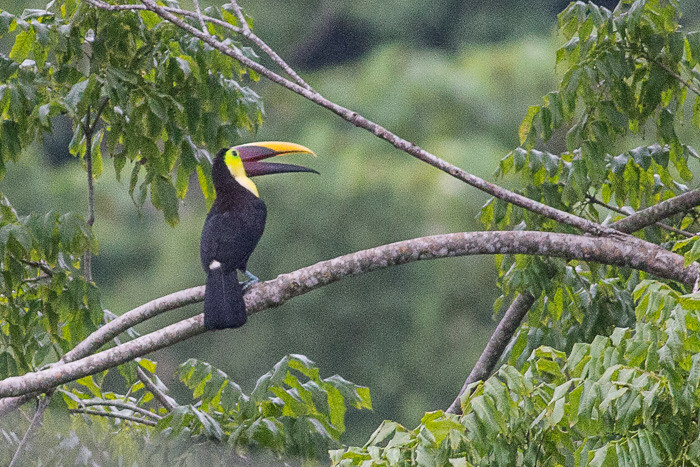 This morning I got up early and wandered along the street next to a chunk of rainforest near the hostel. I ended up with four new species of birds. Not a bad effort considering I did not expect anything. 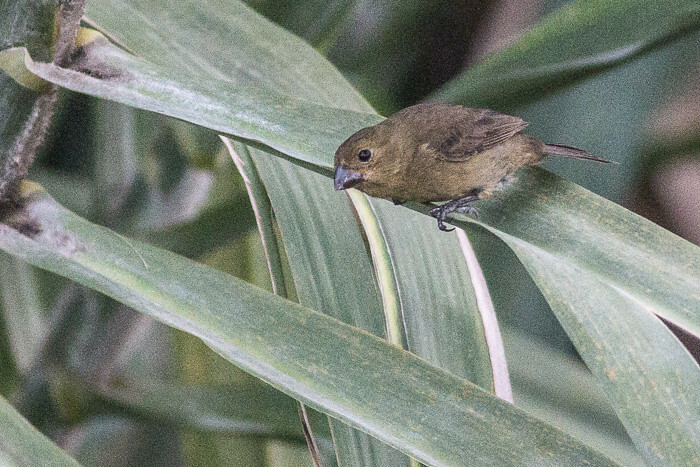 I am quite happy to get a photo of a Variable Seedeater. This one just plopped down in the grass in front of me and started chomping away on the seeds. 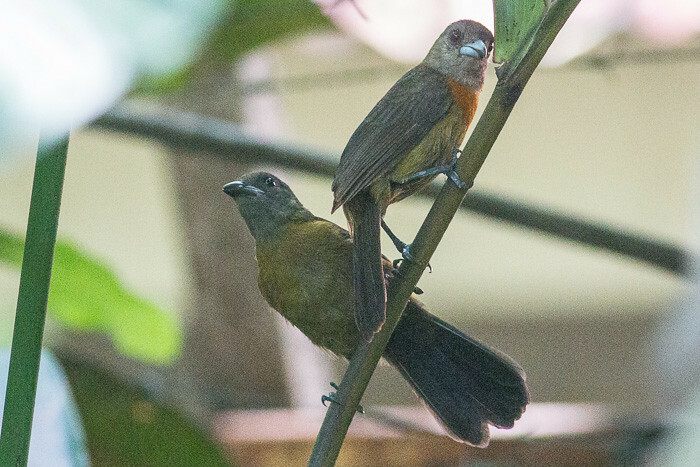 I thought these were Cherrie’s Tanagers at first but they were definitely different. 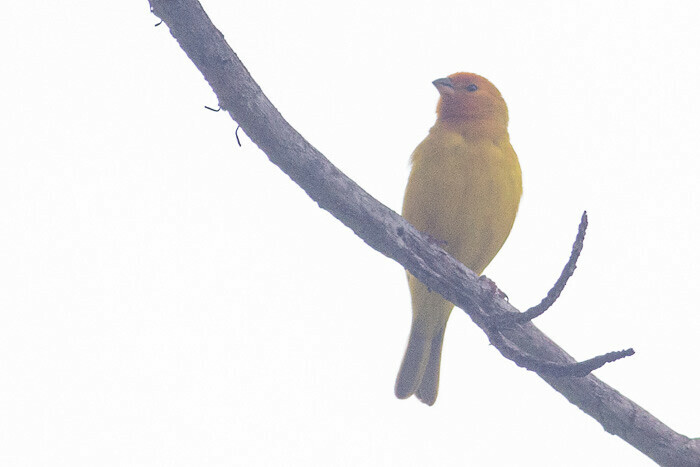 This Saffron Finch just plopped in front of me as well. On my way back from breakfast at Macca’s. I thought this was a cuckoo at first. 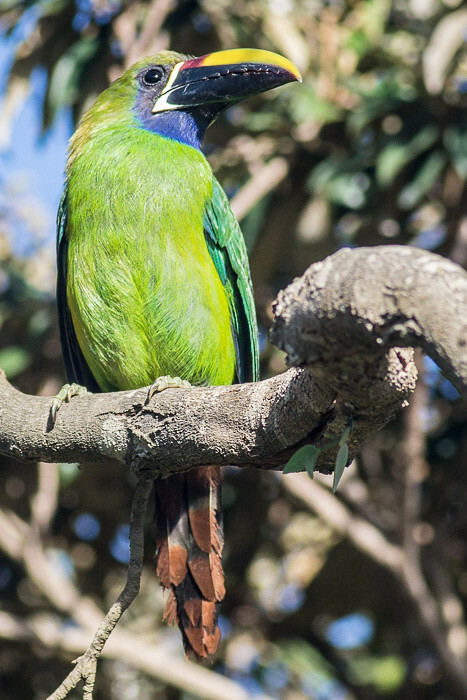 It even looks a bit like a malkoha. 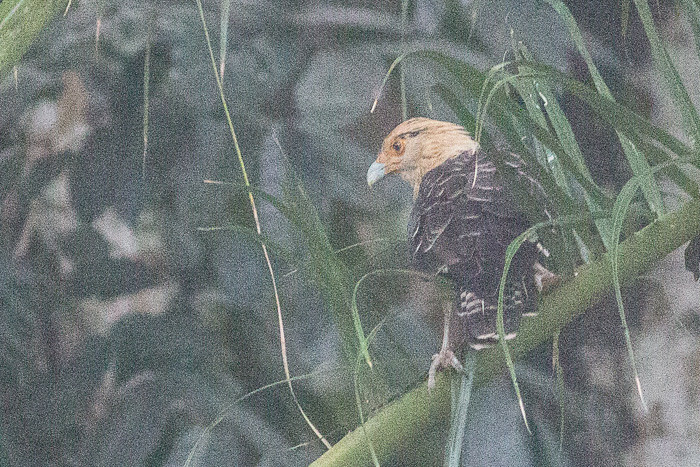 But no, it is a Yellow-headed Caracara. I knew what this was as soon as I saw it. 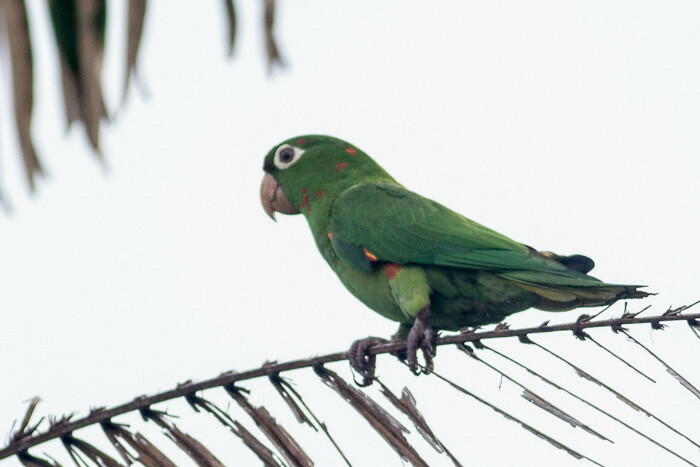 An amazona parrot. I think I have seen them before. I forget where. 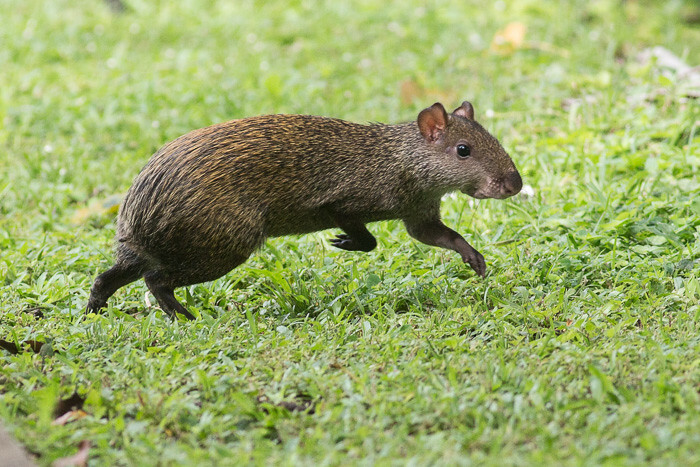 You see these big rats all over the place even near houses. Where do I start. 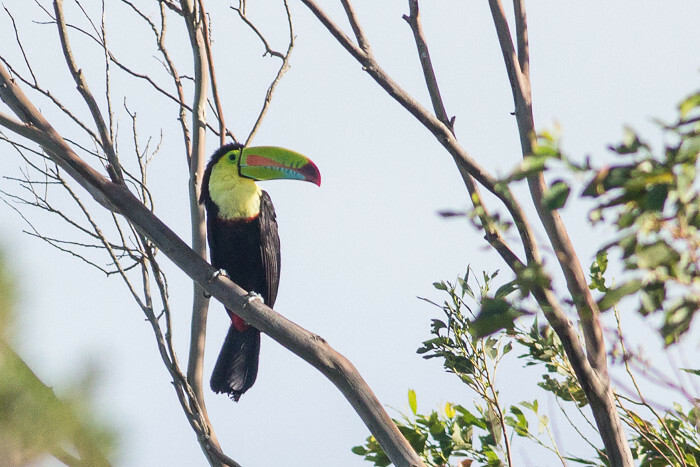 Uvita in Northern Costa Rica. 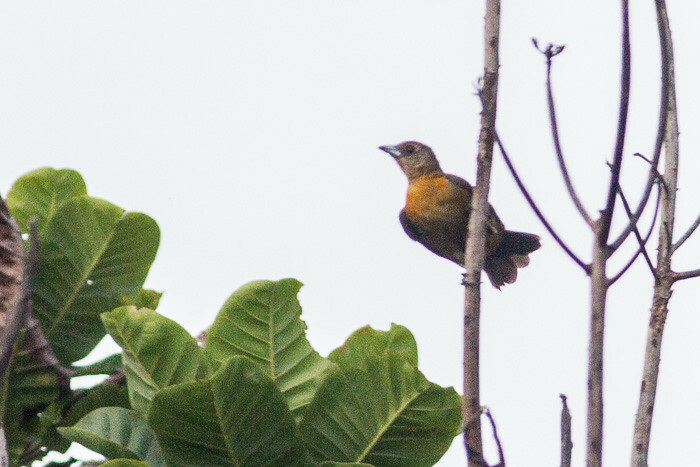 I stayed in a lodge in the jungle but there was not a lot of birds. 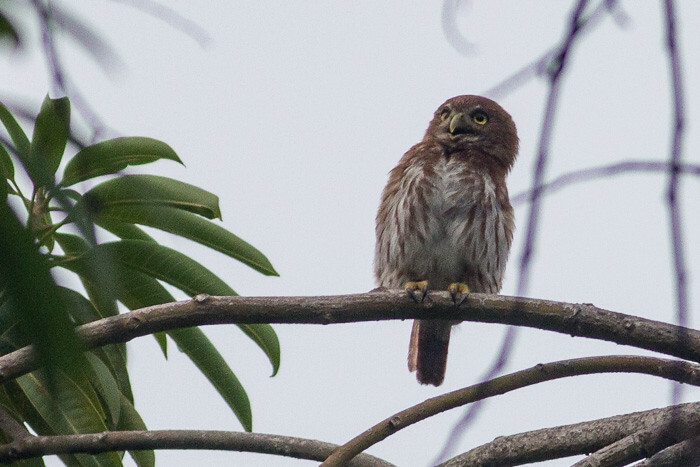 Only a Gray-lined Hawk and a few tanagers. 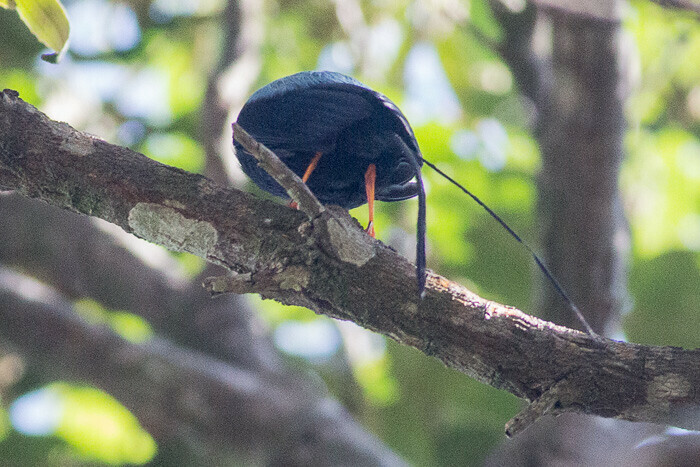 I did see a Montezuma Orpendola fly past but it was a crappy photo. 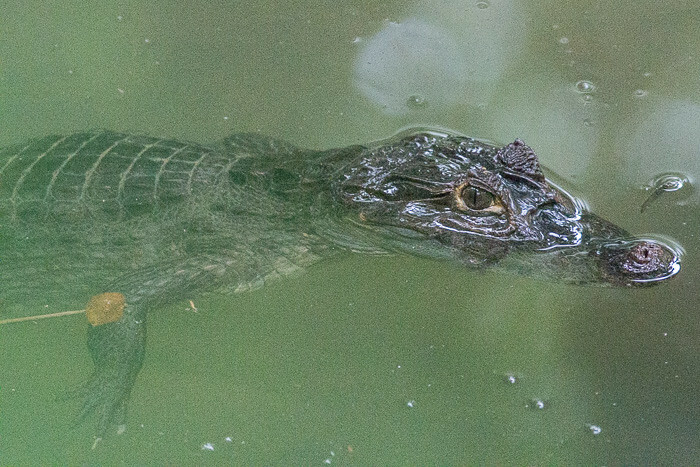 Luckily I got a photo of the Caiman in the pond below the hostel. This morning we got a bus to Gualaca to trek to the canyon. 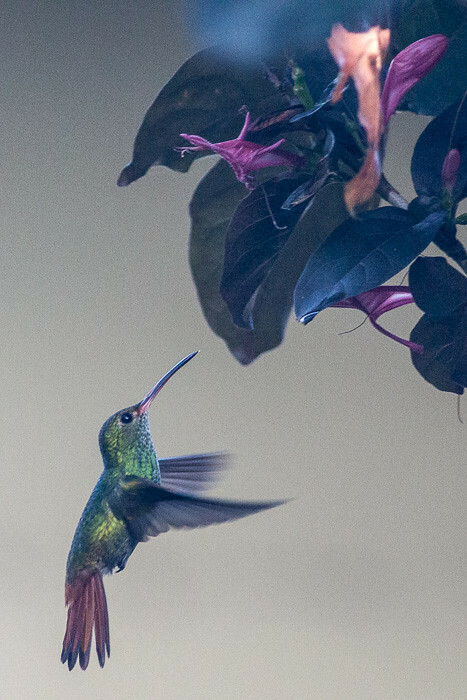 I did not think that there were many bird but I was surprised when I edited up the photos and I had a few new birds. Doh! 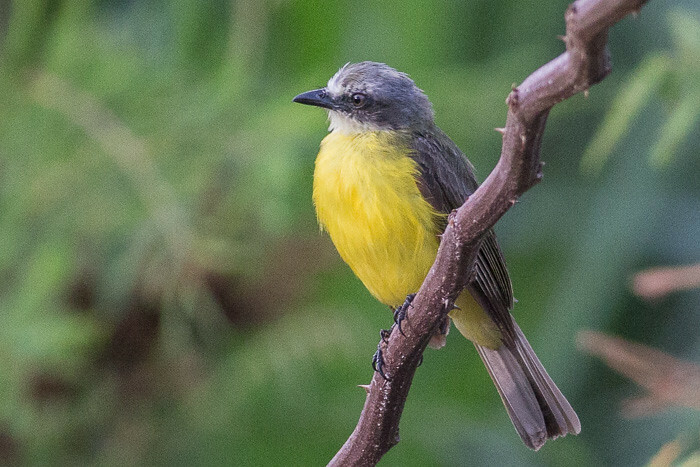 Also called the Yellow-olive Flycatcher. It took me a while to work this out as even the experts did not really know. The key was distribution. This bird was so annoying. 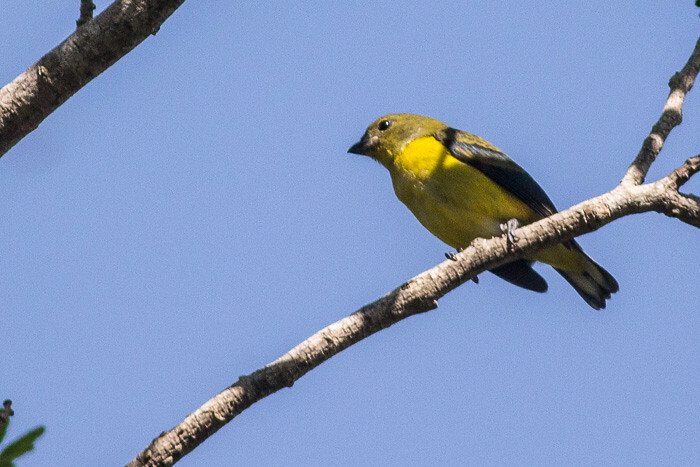 It was twirping over my head and flitting in and out of the branches so I could not get a decent look at it. I got this one on the way back from the river. Pure luck. 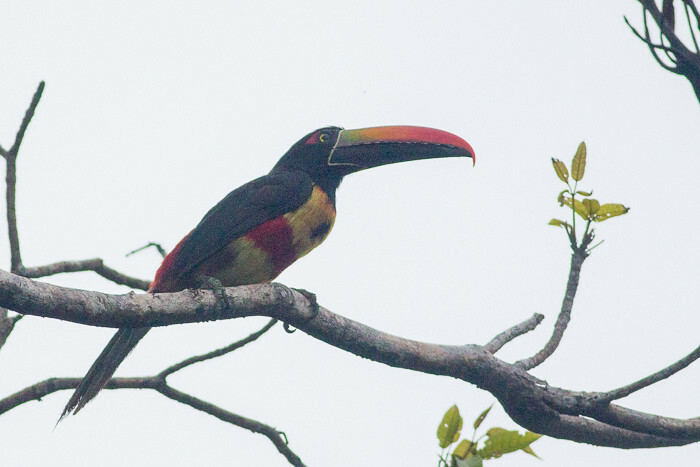 Yesterday afternoon at Manuel Antonio I managed to get some photos of some nice toucans. After that, it poured down rain. Some guys were looking up at a tree and I was wondering what they were looking at. Then they flew past and I realised what they were. I grabbed my camera and by that time they were a fair way away , but I got a reasonable shot. Whew! 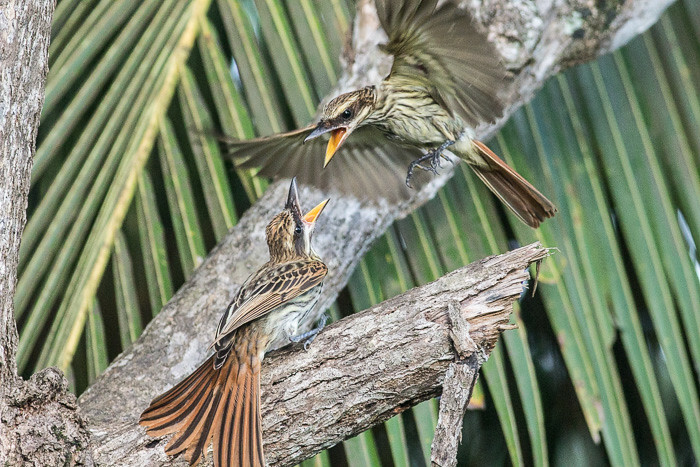 These pair were making such a racket in a palm tree that I thought they were parakeets. 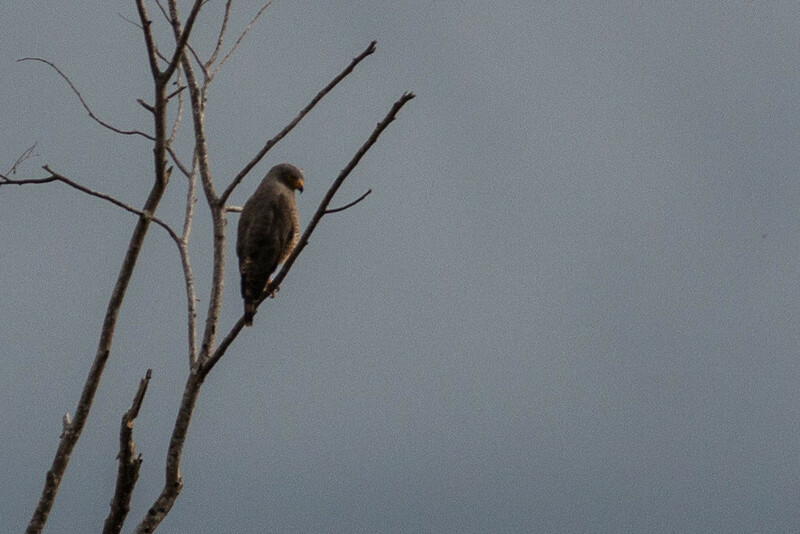 But luckily they flew to a nearby tree and sat there for a while. Thank you. This morning it was raining lightly for a change. I caught the bus to Quepos and waited around for a while, indulging in a decent cup of coffee and a hamburger – luxury! Then I hopped on the bus to Dominical and here I am. 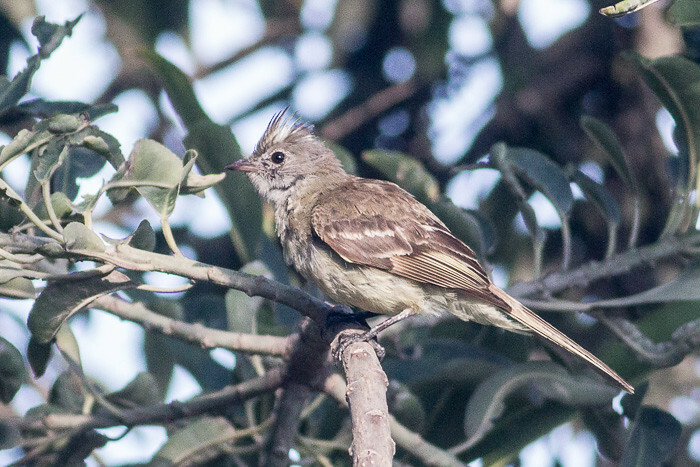 It took me a while to work out what this was – Gray-capped Flycatcher (Myiozetetes granadensis). 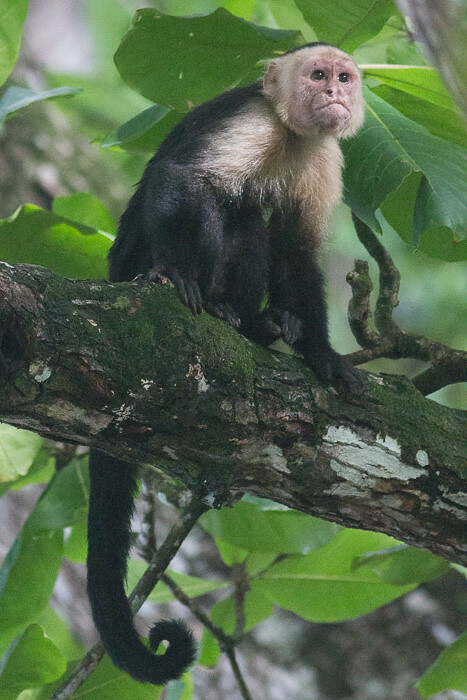 The spanish name is Mosquero Cabecigrís. I had no idea what this was. 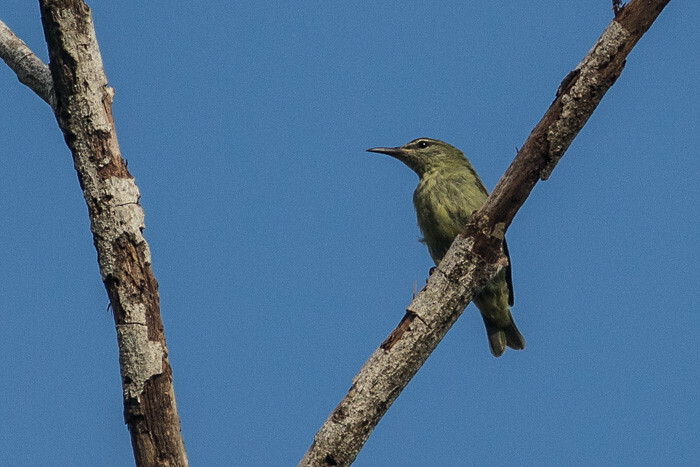 I thought it might have been an Indigo or Painted Bunting at first. But thanks to Luis I got the right identification. The spanish name is Espiguero Variable. 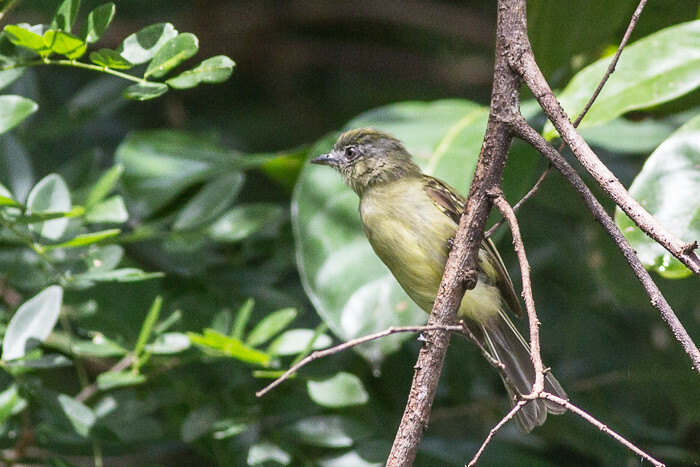 A nice shot of a Palm Tanager showing a lot of green in the tail. It took me a while to decide what this was. The spanish name is Picudo. 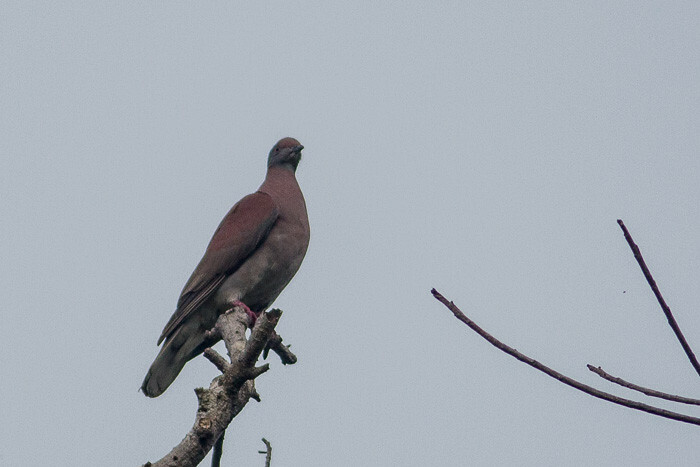 This pair were having a big fight on a tree. The spanish name is Mosquero Listado. 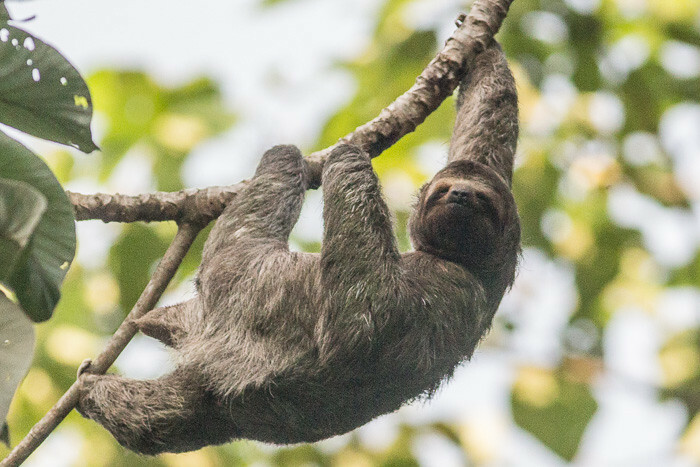 Just hanging about over the road. 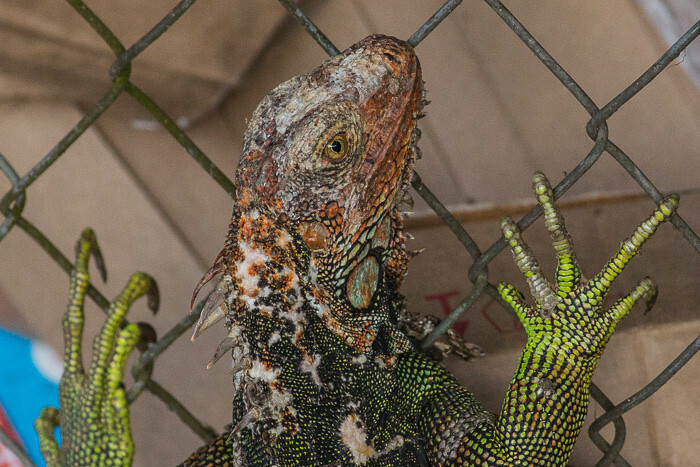 This really ugly iguana was trying to get into the rubbish. He was so fat. 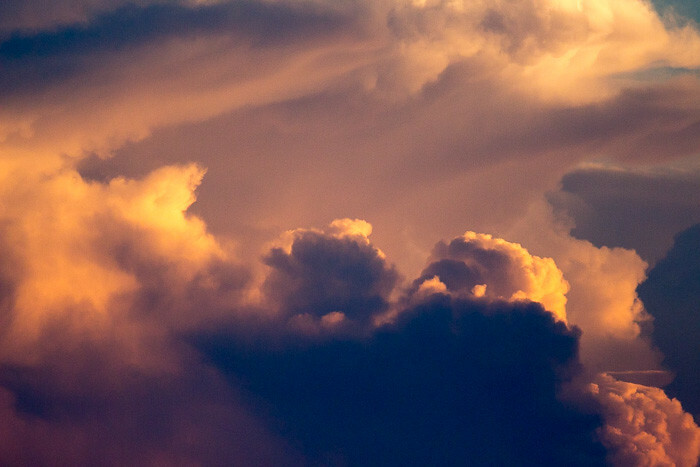 I was watching the sunset so I took some photos of the clouds to see what they turned out like. I like the depth of this photo. 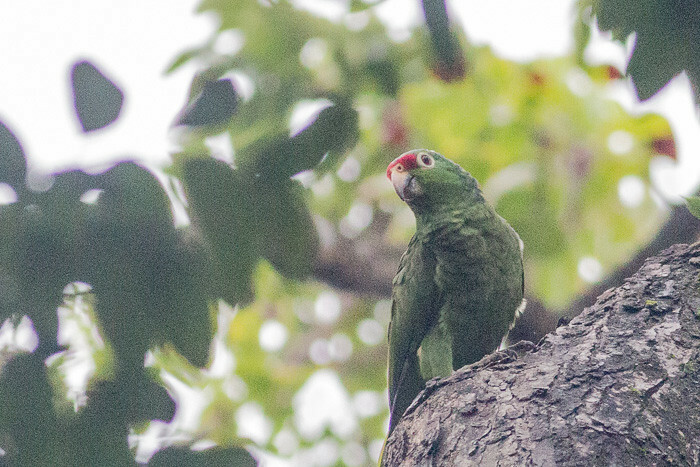 Here is a bird checklist from Hacienda Baru, just near Dominical. 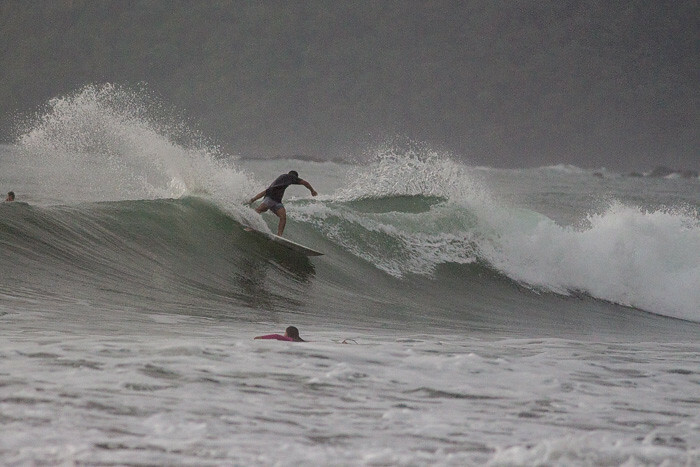 This is part two of my time here in Dominical. Part one is coming up later. I edited them back to front. doh! 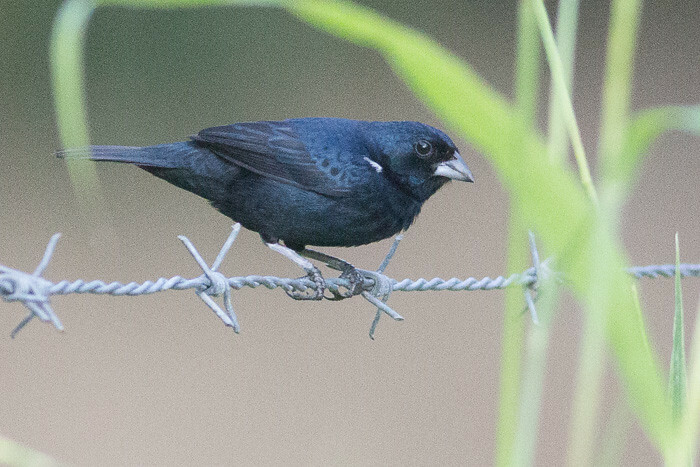 I saw this male Blue-black Grassquit walking along the side of the river. The spanish name is Brea. I found this on the edge of a paddock by the river. 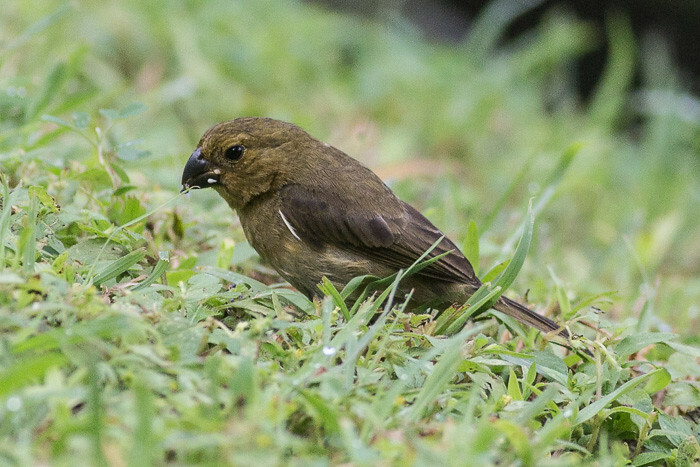 The spanish name for Variable Seedeater is Espiguero Variable. 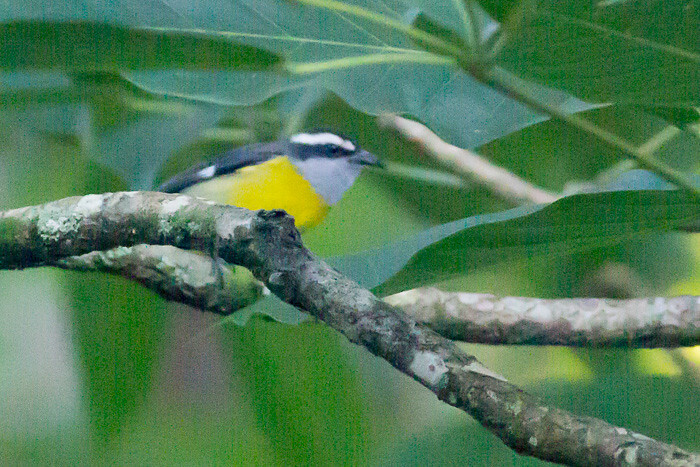 At long last I have seen a Bananaquit. It took me a while to work out what it was. 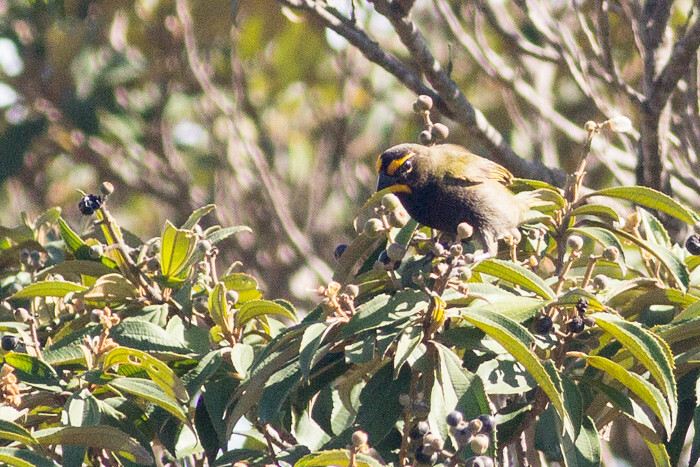 The spanish name of the Bananaquit is Picaflor. 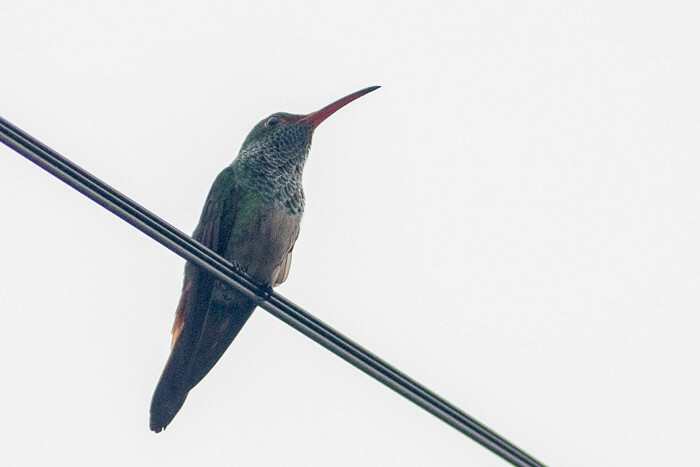 I spied this flying into the trees near some houses. 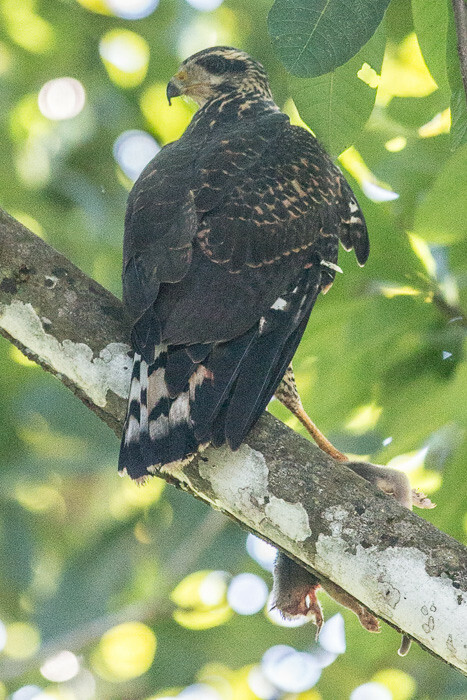 This immature Common Black-Hawk has caught what looks like a possum or a squirrel. Very good for a young bird. 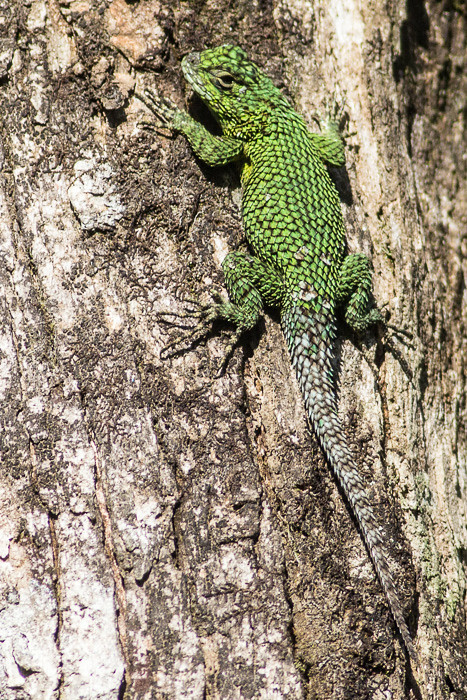 Its spanish name is Gavilán Cangrejero. 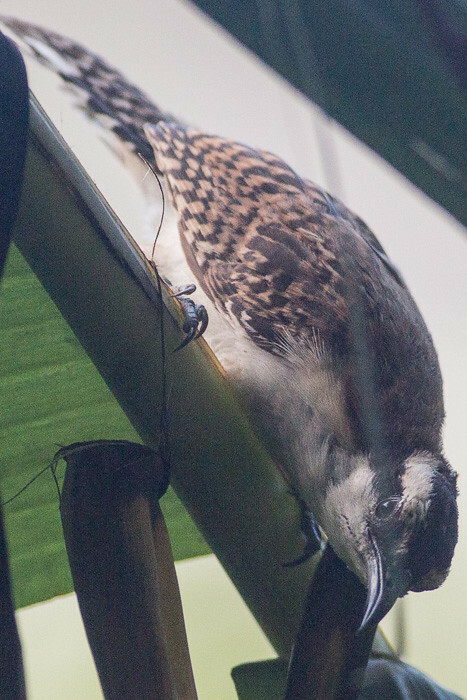 This is an adult and it had a nest very close to here. It buzzed me a few times because I was too close to it. I moved away as soon as I could. I split up the folder again because I took more than 600 photos. It works good I reckon. And it spreads the photos out so they are not jammed into one post. This morning I walked down the beach and then headed up the road towards the national park. 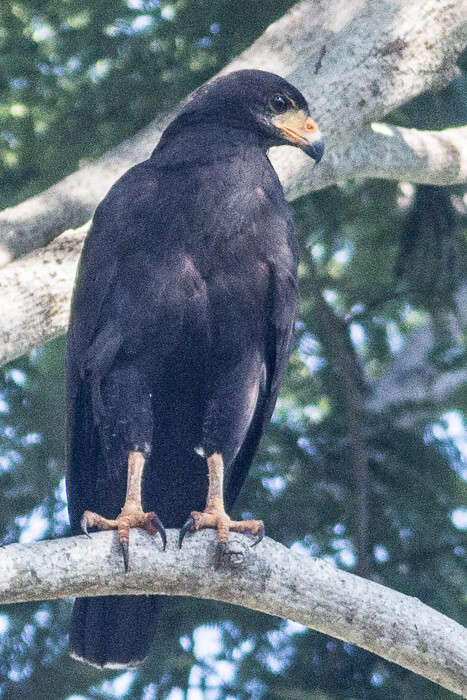 I saw this Common Black-hawk screaming in a tree. I think it is a young one. Edit: No it is an adult. 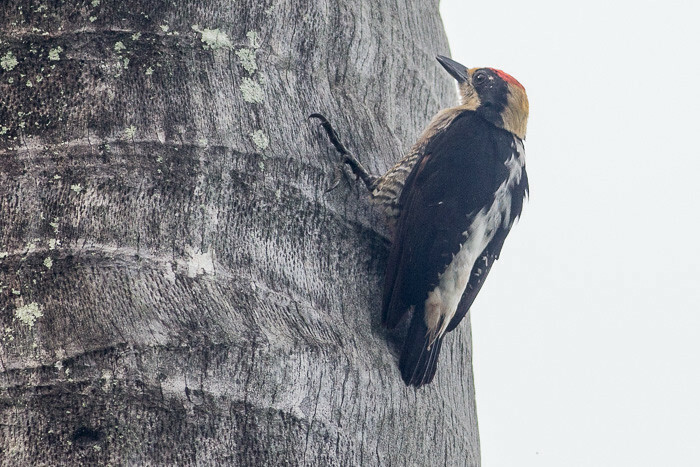 At first I thought it was a Golden-fronted Woodpecker but the white stripe down the back got me looking closer. 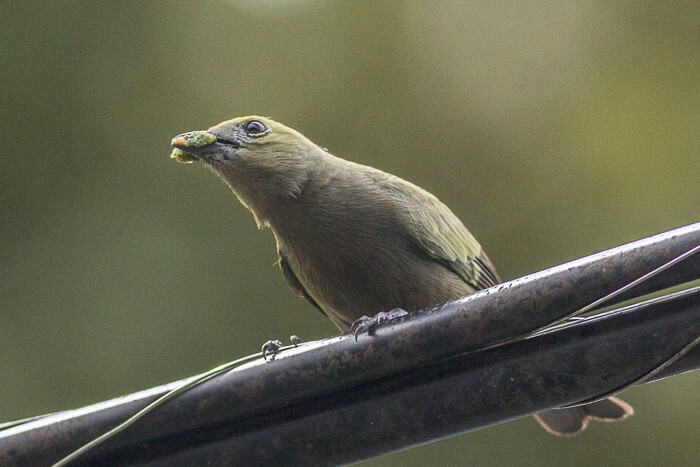 Finally I got a photo of a Palm Tanager. 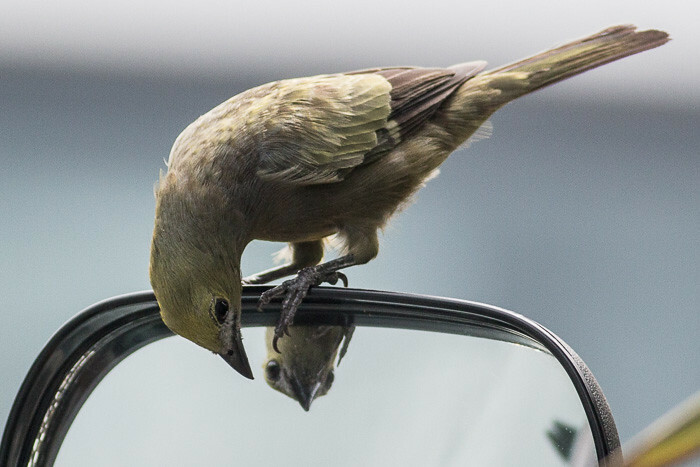 This Palm Tanager kept looking at himself in the car mirror. 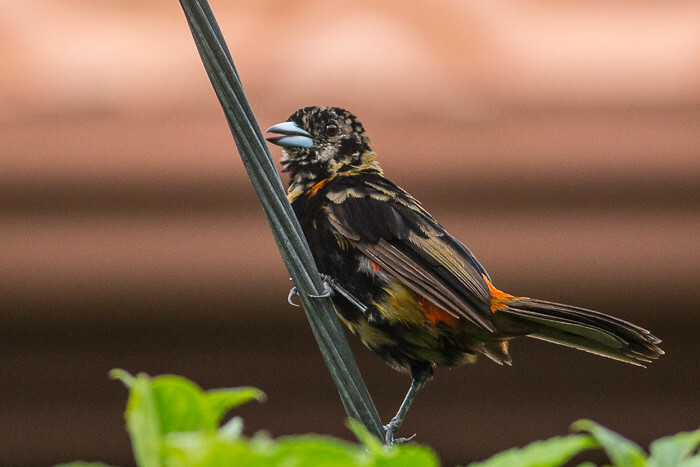 I think this is an eclipse male Cherrie’s Tanager. 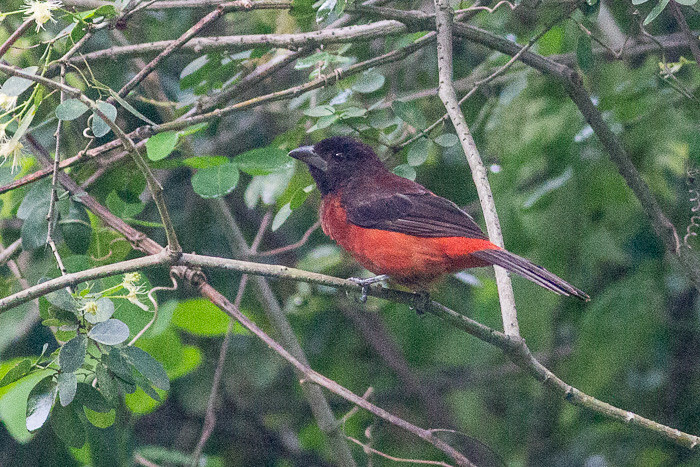 And the male Cherrie’s Tanager. I caught a bus just outside the hostel in Jaco at mid-day to Quepos. After a leisurely couple of hours in the bus, I made it to Quepos, where I had dinner, watched England beat Tunisia, then jumped on the bus to Manuel Antonio. Very easy. 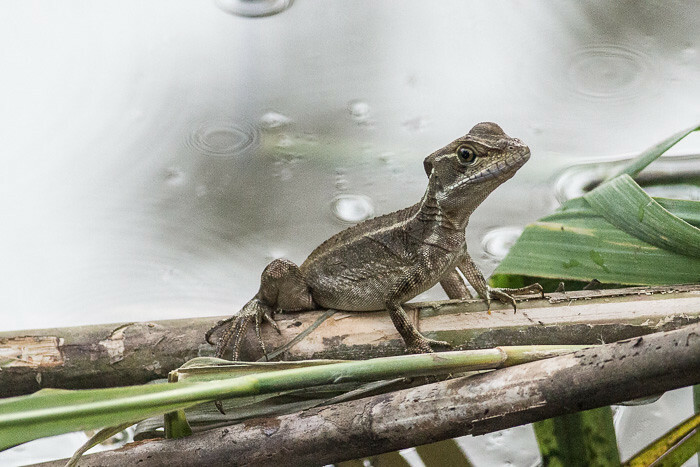 There were a couple of photos left in the camera from the back yard in Jaco. 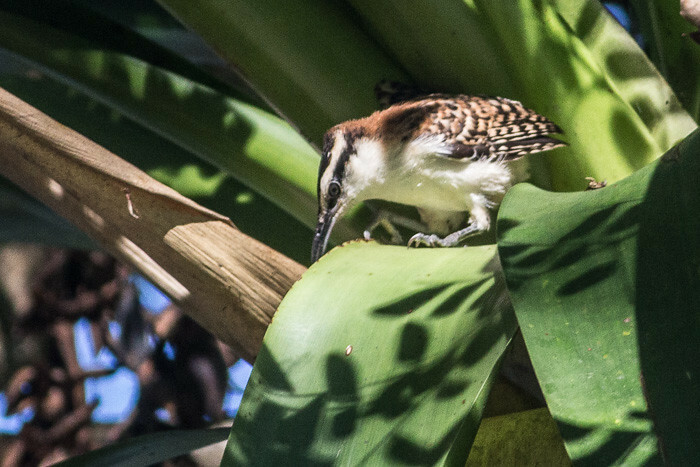 I think this is a Rufous-and-white Wren. 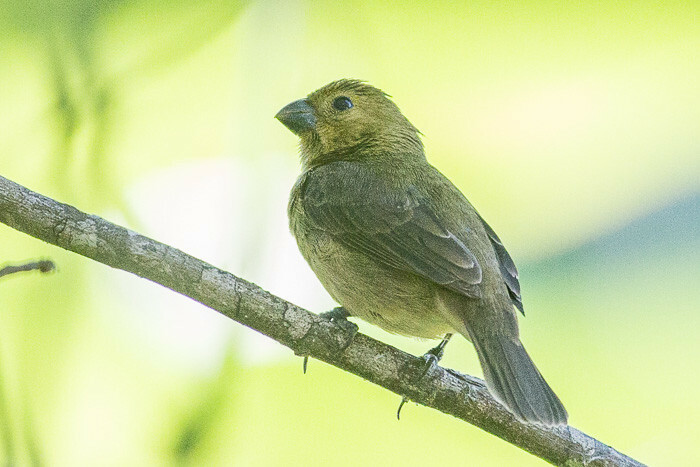 I took a guess that this was female and immature Cherrie’s Tanager. It is not in my book. 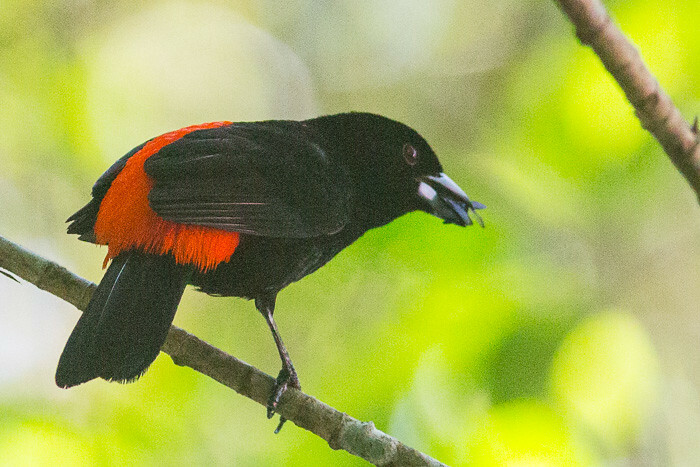 And this is the spectacular male Cherrie’s Tanager. 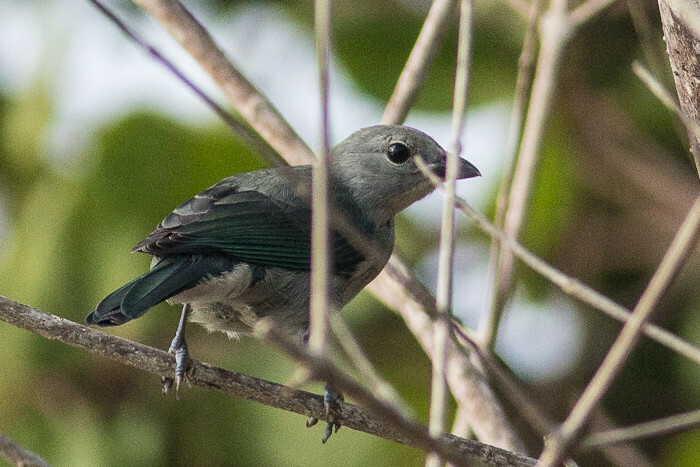 Passerini’s Tanager looks exactly the same but is found on the Caribbean coast. I think so. But must get some help. Thanks Eitan. 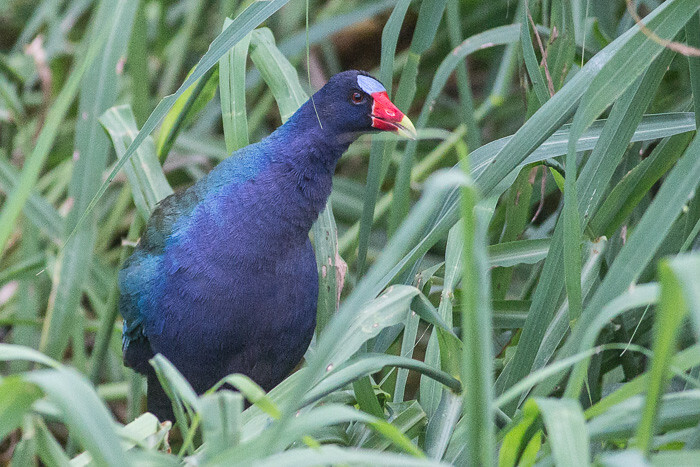 I thought this was a Red-billed Pigeon. doh! 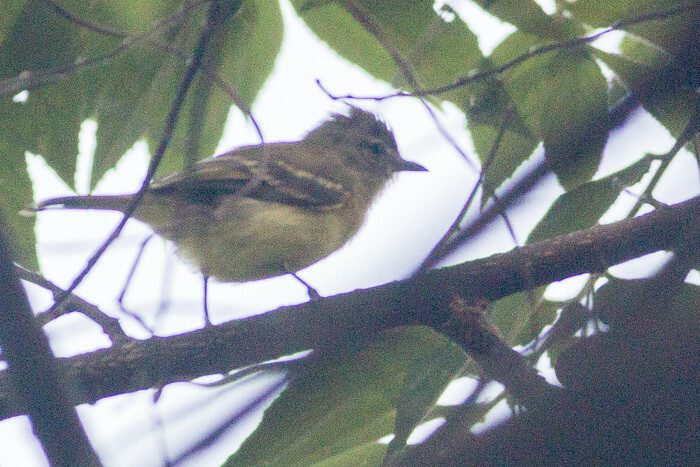 Again, I need some help to id this. After the cool mountain air of Monteverde, it was a shock coming back to the heat and humidity of the coast. I caught the 5:30am bus from the end of our street in Monteverde and arrived in Puntarenas in time for a lovely tipico breakfast of rice and beans, omlet and spicy sausage, slugged down with black coffee. The bus left at 9am and I arrived in Jaco pretty early. I found my party hostel and checked in after a few hours wandering around. 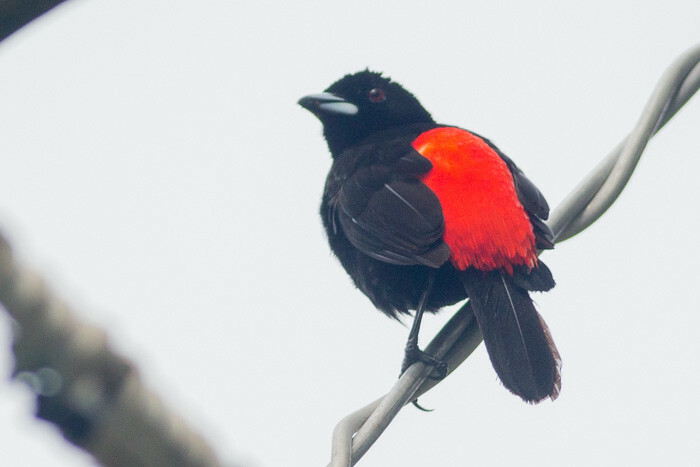 It took me a while to suss out what this was – a Passerini”s Tanager (Ramphocelus passerinii), male and a not Red-winged Blackbird or Scarlet-rumped Cacique. 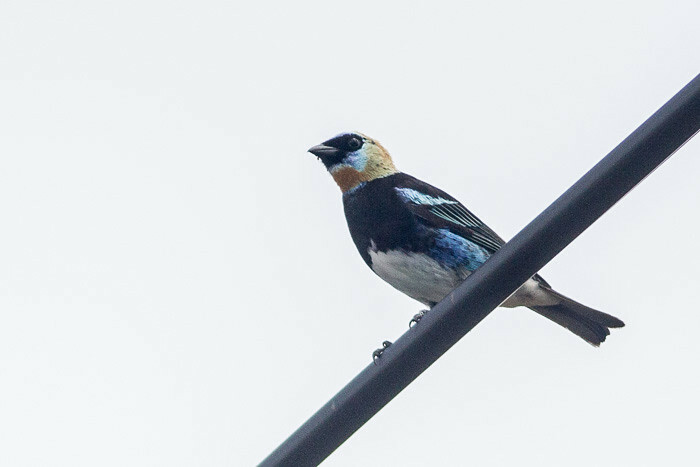 This bird was just out the back of my hostel. Edit: totally wrong. 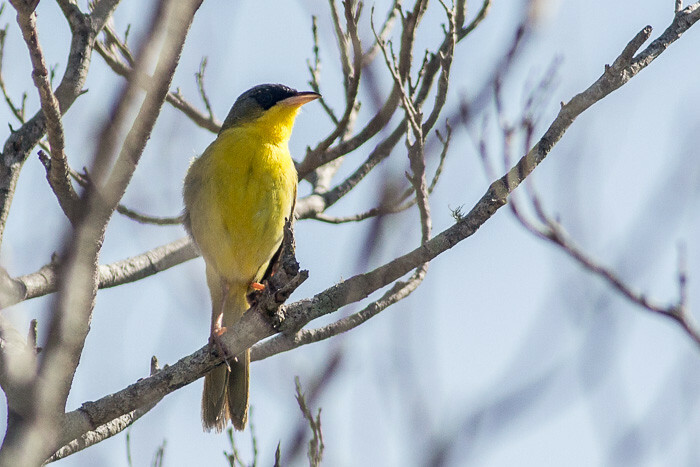 The Passerini’s are on the Caribbean coastt and Cherrie’s Tanager are on the Pacific coast. doh! Thanks to Sandra for setting me on the right track. Not sure about this. 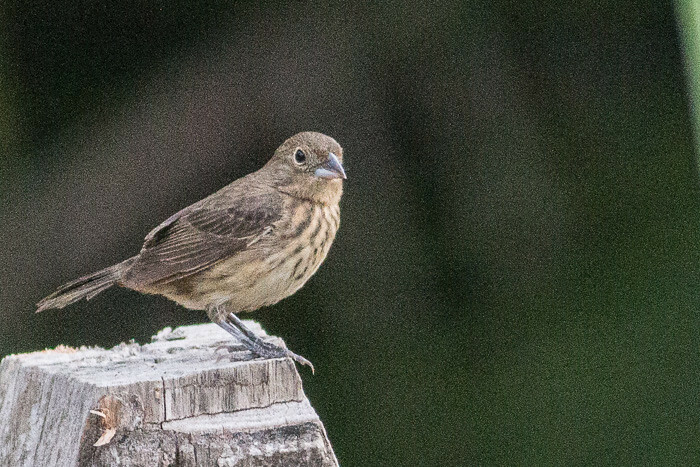 Maybe a Blue Seedeater or a grosbeak. 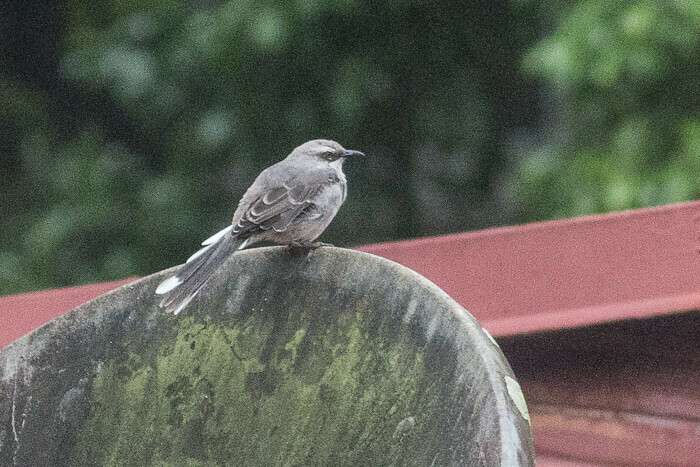 Waiting for some id help. Edit: thanks to Patrick for the identification. This might be the female. But the stripes on the chest have got me going. 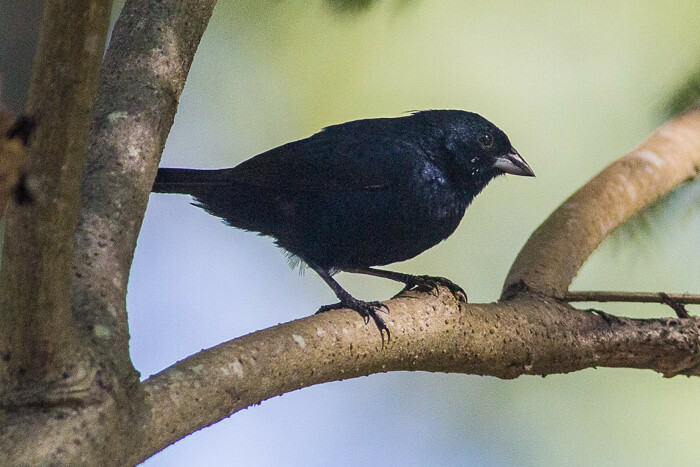 No, it is an immature Blue-black Grassquit (Volatinia jacarina). Thanks Patrick. I really have no idea what this is. I had the wrong coast. 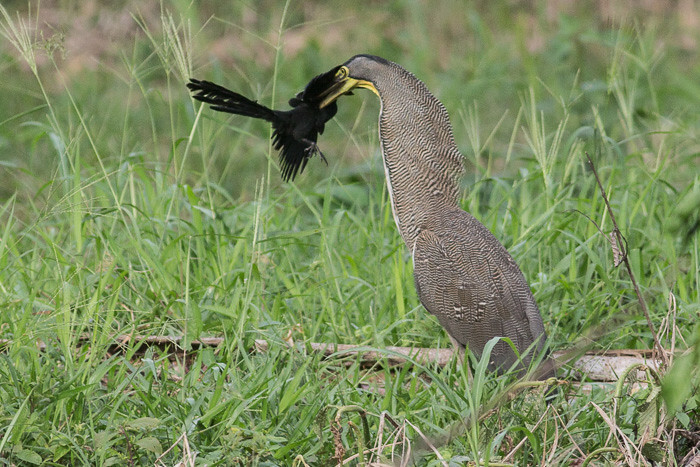 I spotted this Bare-throated Tiger-heron stalking something and then it had this black bird. I am not sure what it is. 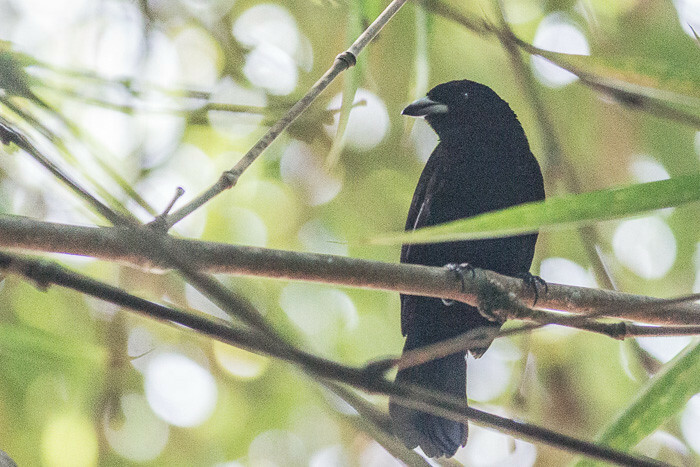 Maybe a grackle or a Groove-billed Ani. The heron was bashing it and trying to eat it. I have never seen that before. 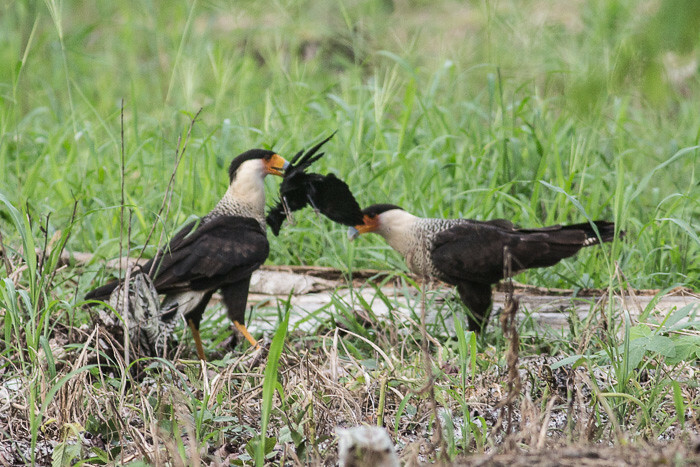 Then a pair of Crested Caracaras turn up and stole the dead bird from the heron which flew away screeching. Amazing. 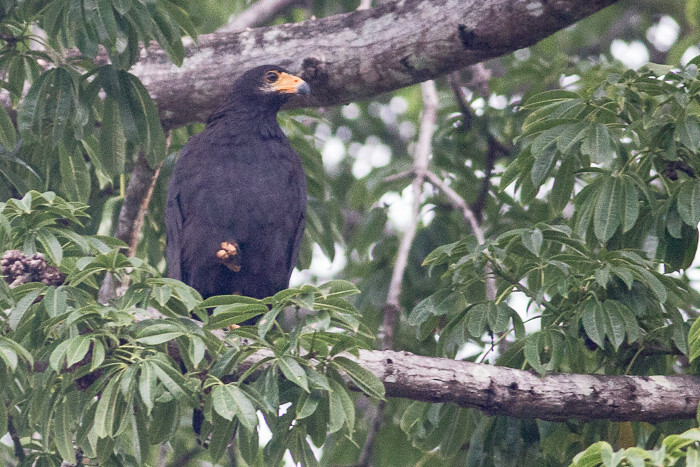 The caracaras then proceeding to eat the black bird. 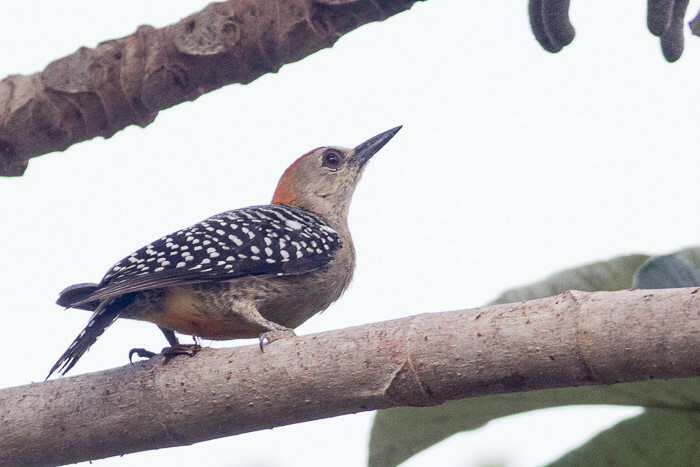 At last a relatively decent photo of a Hoffmann’s Woodpecker. 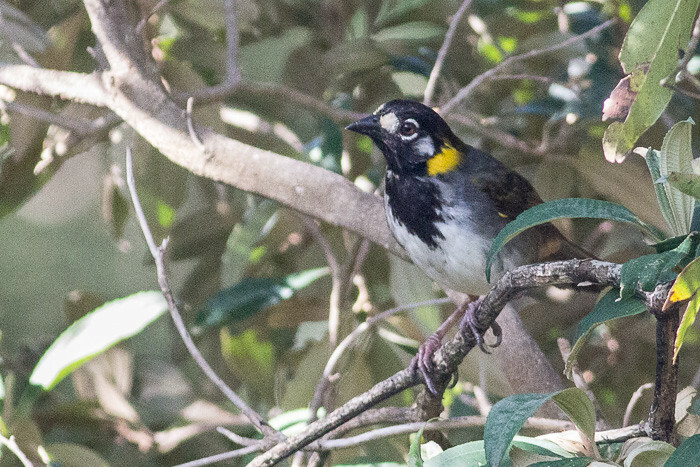 There were quite a few birds around the creek near the football ground. In the back yard of the hostel in the tree. This morning I started at 6:30am with my guide Freddy. We just went up the ridge about a kilometer and walked along a side track for a kilometer or so. 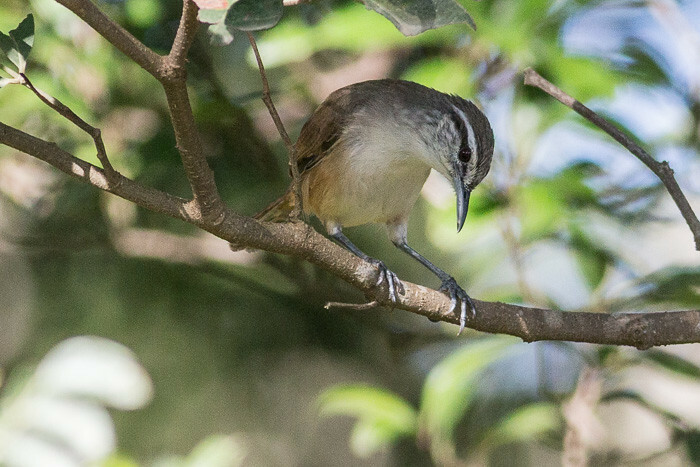 We met a young bird photographer from Melbourne. He had a 600 lens and I was so glad I did not have to lug that thing. And the tripod, even though it was carbon fibre. Maybe it is about time they made lenses that do not weigh much. ha ha. 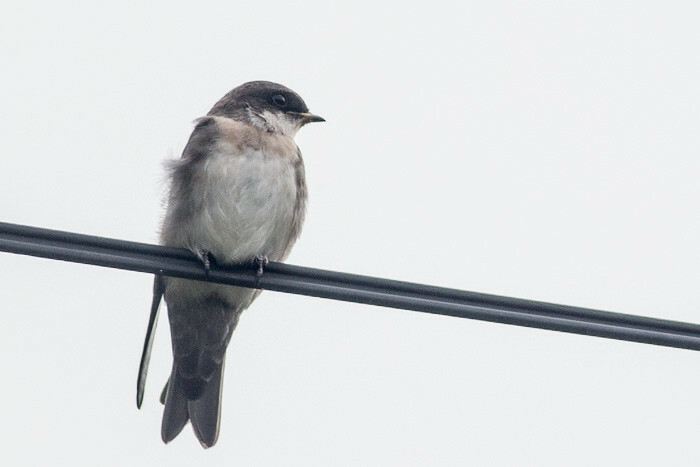 A new bird, not so many today but that always happens on the second day. Very yellow. 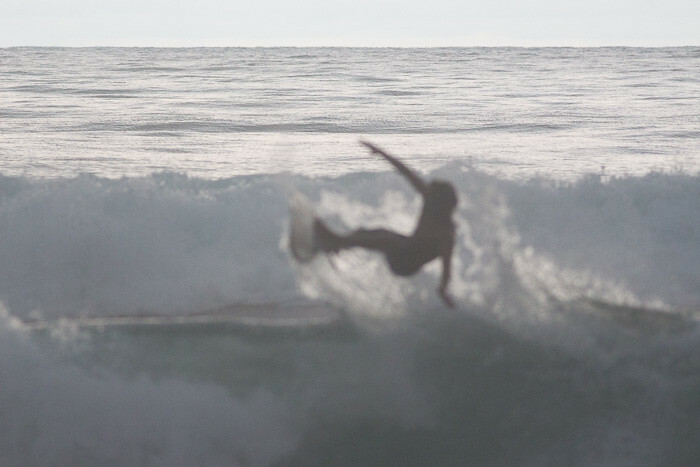 All the other shots were out of focus, so here is an arse shot, doh! At last a decent shot. This is a better photo than yesterday but still not good. 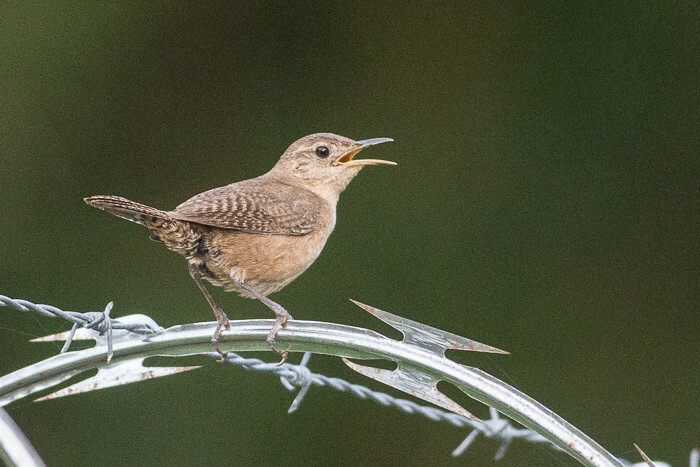 I am liking the wrens of Central America. They are very cute. 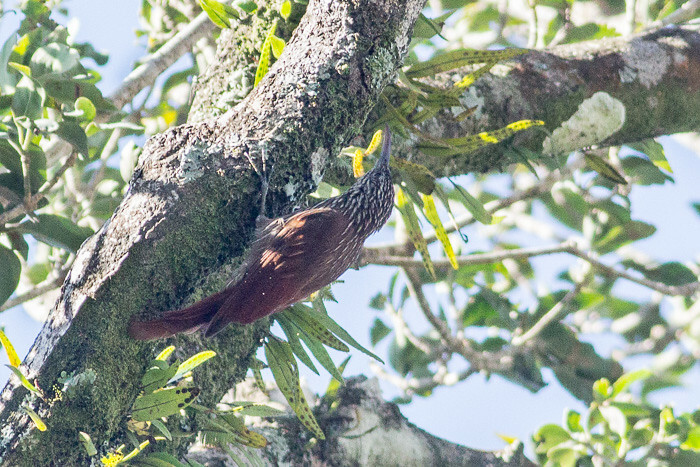 I was thinking this might be a Cocoa Woodcreeper but the bill is all wrong I reckon. I saw these in the grass with the seedeaters. 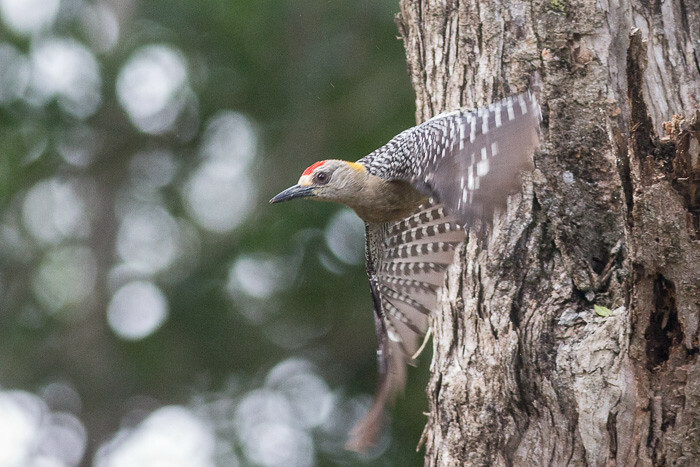 The best I have got of the Hoffman’s Woodpecker. Still not great but it is a good action shot.